Colin Kaepernick no. 7 and Eric Reid no. 35, of the San Francisco 49ers, protest before a game on September 12, 2016, in Santa Clara, California. In another escalation of the controversy over NFL players protesting during the national anthem, former San Francisco 49er Colin Kaepernick has filed a grievance accusing NFL teams of colluding to keep him out of the league. In 2016, Kaepernick stopped standing during the anthem to protest the oppression of people of color, and a handful of other athletes began to do the same. At the end of last season he opted out of his contract with the 49ers, reportedly because they were planning to cut him. That made him a free agent, available to sign with any team, yet he remains unemployed. Kaepernick led the 49ers to the Super Bowl in 2013, and there’s general agreement that he’s talented enough to be playing this season. “Good quarterbacks often never even reach free agency, let alone remain unsigned for so long,” Five Thirty Eight noted in August. 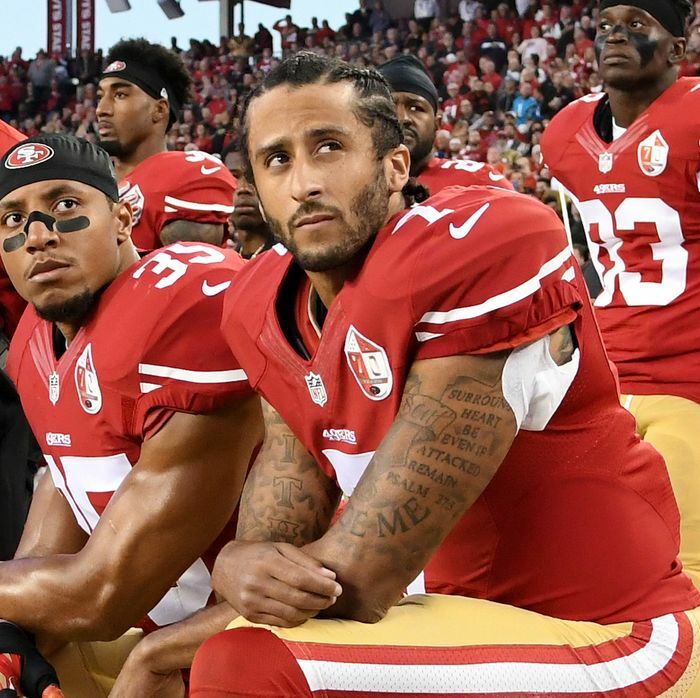 Teams have repeatedly signed less promising quarterbacks over Kaepernick, and many argued he was being passed over for political reasons, even before President Trump ignited the controversy with his remarks last month. So where might Kaepernick have uncovered evidence that he believes proves collusion? We know that if it occurred, it must have been within the last 90 days, as under Article 17 of the CBA a player has that long to file a grievance. Otherwise we are left to speculate. McCann is skeptical of this argument. Kaepernick would have to prove that owners colluded through Trump, since the president isn’t subject to the NFL’s labor agreement (even if he’s injected himself into the situation).